Upper body exercises for women should include those that work to stabilize the core and shoulder girdle complex while also strengthening the muscles of the shoulders, chest, upper back, and abdomen. I like to use the Principles of Pilates for upper body exercises because you get not only the strength and tone, but also you get the benefits of decreased risk of injury in the shoulder joint. Pilates upper arm exercises first focus is on stabilizing the shoulder joint complex so then you can mobilize the arm for better and safer range of motion and less risk for injury. If you are looking for specific upper back exercises there is some good information at this page. 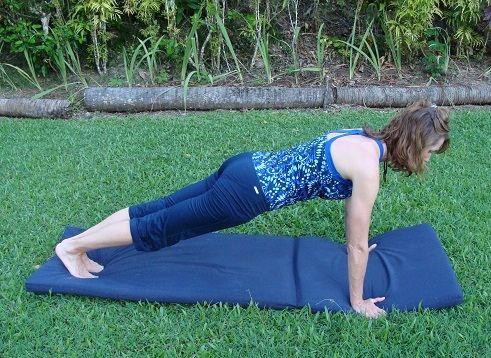 One of the best ways Pilates for upper body exercises for women that I have found is the front Plank. The Front Plank is one of those exercises that really challenges the whole of the upper body without doing anything but just supporting your body weight. The challenge here is to keep the abdominal muscles pulled up and in and the shoulder blades wide on the back (not pinching together). Add in some pushups for more strength. Press into your hands keeping both the chest and shoulder blades wide. Squeeze your inner thighs together and reach out through your heels. Pull your abdomen up and in without squeezing your buns too much. Reach up through the back of your head and shoulders keeping the neck long and just looking to the top of your mat. Breathe in and out deeply feeling the length and control for 3 sets. The Plank with One Leg Extension is another challenge in that it requires more side oblique control, widdle that waistline, along with shoulder stability. Adding this little variation to the regular plank can really find the imbalances in the strength and support of the core of the body quickly. The mat is a great way to get a good in arm workouts for women no matter where you are, but nothing can beat the spring tension and stretch you get on the Pilates Reformer. 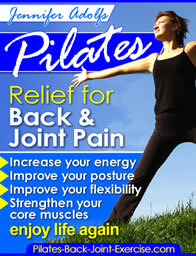 Check out some of my upper arm exercises and for better range of motion here on the Pilates Reformer. and... For your Shoulders with a Stretch Band. Pick out the exercises that work best for you and do them 3 days a week for improved strength, posture, and decreased risk of pain and injury in the shoulder joint.